Slorgeel hunts by launching its elongated tongue at prey, which is tipped with a venomous harpoon. If attacked, it has the ability to secrete a thick, gooey slime that can clog up a predator’s throat and stick their jaws together. 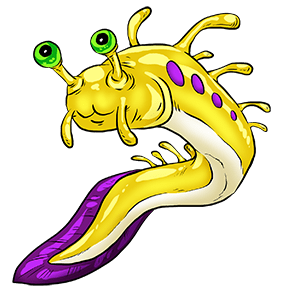 When it has a good relationship with its tamer, it will allow them to scratch its gills and other hard to reach places without sliming or stinging them. It prefers to keep itself hidden; feral specimens can be found lurking in coral reefs and rock piles.